HUGH Gallagher became the first Omagh man to lift the O'Neill Cup in 26 years when St Enda's beat Carrickmore in the Tyrone county final. On Sunday he'll be the first man in the club's 82-year history to raise the Seamus McFerran Cup aloft. But first they've got to beat Slaughtneil and it goes without saying that that will not be easy. Omagh have never got to this stage before and Gallagher (right) says there's no magic ingredient behind this season's great leap forward. "Joey and Justy (the McMahon brothers) being fit are two massive additions for us. Ronan (O'Neill) back being fit, Conan (Grugan) is fit, no other injuries," said the 27-year-old doctor. "If you look back at last year, it just didn't go that well. The year before, Ronan got injured. We were under Liam Grugan that year and we really thought we were going to go well, and we were going well, everything was right, we just missed Ronan up front. "We drew with Clonoe, Joey ended up getting sent off, then we missed a bagful against Errigal. You sort of wondered was it ever going to happen for you, so that was that year. 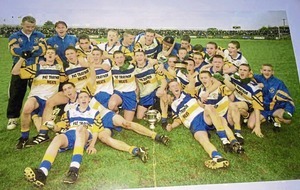 "The year before Paddy Crozier was there and we lost to Carrickmore in the semi-final after a replay. Those boys were all young: 18, 19, 20. Now they are 22, 23. I am 27. Joey is 30, 31, but you need that age bracket rather than everybody being under 25. "You need everything going right as well, as it is under Larry [Strain]. People ask what is the difference but there is no difference. No magic formula, just getting the simple things right, and the wee bit of luck." He watched Slaughtneil beat Kilrea in Derry this season and was impressed by Mickey Moran's side. 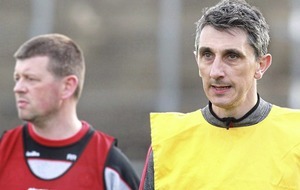 The Emmet's have also had luck with injuries and, as a dual club, they've been fighting on two fronts. "They are a really, really solid team," said Gallagher. "They have a good defence, six men that you would be happy to go with toe-to-toe. "In midfield, Patsy Bradley and big Phelim McGuigan are good, then the forward line, you have Chrissy Bradley and everything seems to go through him, then Paul Bradley and Pa Kelly as well, they have been about years. "They have county men, ex-county men. A good, strong solid team."